This was soooo yummy. And so easy to make. I had a taco salad at Wendy’s last week and it was so yummy that I thought I’d give it a try camping. It is one of those meals that doesn’t take long to cook. It takes minimal ingredients, and kids love it because they get to dig in with their hands. And really. Who doesn’t love nachos and dip. First step is to make chilli. Or if you are prepared, you made it at home and froze it, to keep other food in your cooler cold. 1 pkg of chilli seasoning. Brown the ground beef. add the kidney beans (drained), the tomatos and the seasoning. Heat it up, and you have chilli. I also added onions when I cooked the beef. You could add chopped green peppers too, if you are so inclined. Put down a layer of lettuce, tomato on top of that, then a handful of the cheese. Put a couple of spoonfuls of chilli on top of that. Top with a spoonful of sour cream and salsa. Eat it up with the nacho chips. Well, ok, you can use a fork, but where’s the fun in that. 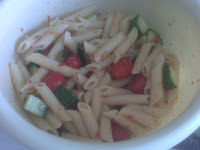 This entry was posted in Recipes on June 29, 2009 by admin. aka bacon makes everything taste better. HA. I’ve always had problems with foil packets. Especially with potatos. They always, always, always stick to the foil and you end up either eating foil (so gross) or wasting half of the potatos. It does n’t matter how much I prepared the foil with butter or oil or precooked the potatos, they always stick. The cure, is bacon. I still get a few stuck, but nowhere near wasting half of them. I just chop up a few slices of bacon and put some down before I put the potatos and whatever else I’m putting in the packets, and then put some on top. And the bacon flavour really does well mixed with the veggies too. In my foil packets I usually put potatos, onions, bacon and cheese. mm mm good. Let me know how your foil packets turn out. This entry was posted in Recipes on June 17, 2009 by admin.